I remember one occasion where former Mayor Rudy Giuliani was chastising the press for asking questions he considered inappropriate at the time and focusing on the negative. Now although Giuliani was not seen as the poster child for warmth and tenderness, his point was well taken. The media and consumers of media are fueled more by the negative than the positive. Violence, infidelity, crime, tragedy, war and crisis all certainly draw more attention than tales of goodness. Unless they are supreme acts of philanthropy in the league of Mother Teresa, some element of drama or sensationalism is needed to pique the interest of readers and viewers - otherwise the story will be lost in the slush pile. People want to hear tales like that of former Governor Eliot Spitzer caught with a prostitute, not about a man who helps a disabled person across the street. Competition for people's attention is fierce and even extreme occurrences can become tiresome for many. Children do not immediately come to mind when thinking about New York City, particularly for the visitor or resident without children. But they are part of the fabric of the city along with their parents, all doing what parents, children and families do, reconfigured for city life. 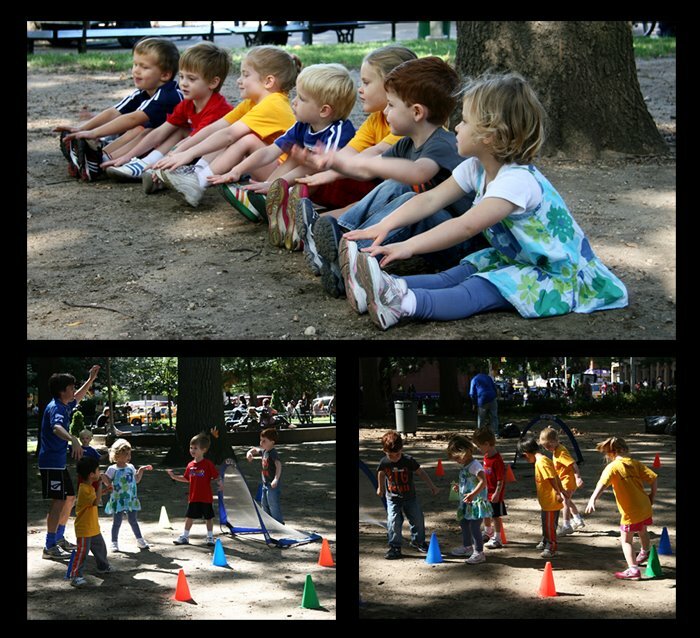 Although soccer is big with kids in America, I was still surprised to see a group in training one morning in Washington Square Park. This group was part of a program called Super Soccerstars, "founded in the year 2000 by Gustavo Szulansky, a New York City father of three and native of Argentina. With fύtbol in his blood and having spent countless dollars searching for quality programs for his own children, he founded the program determined to build the best children’s program anywhere." You can read more about them here at their website. The humanity of seeing children at play is a heartwarming experience - even more so in New York when it is so often unexpected - schools and playgrounds pop up in the most inhospitable places, surrounded by the maelstrom of a frenetic city - see here for my story Mary Celeste.